The benefits of consuming ham have been more than confirmed by leading scientists. However, not all hams are the same, or have been cured the same way. In this article we’d like to briefly explain why our ham with the denomination “Protected Geographical Indication” of Trevélez, IGP Nevadensis and our alternative brand Prados de Villareal, come with the guarantee of an unmistakable natural, smooth flavour. At Nevadensis we have mastered the secrets of curing Ham with Protected Geographical Indication Trevélez the natural way. We use a process without chemicals or any artificial additives, only natural seasalt from the nearby coastal nature reserve “Cabo de Gata”. This is made possible by our unique location, in the heart of the Sierra Nevada Natural Park. Cool, clean air and generations of experience are what make our hams special. Our natural curing process preserves all the natural goodness of the ham, such as the presence of Omega 3, an important antioxidant which can help lower cholesterol. The entire process of curing ham is based on the knowledge of our ancestors, complimented by modern and rigorous food safety- and quality controls, and a love for producing the best cured ham. Our denomination stems from our unique location in the Sierra Nevada Natural Park, which combines all the elements for producing the perfect cured ham. 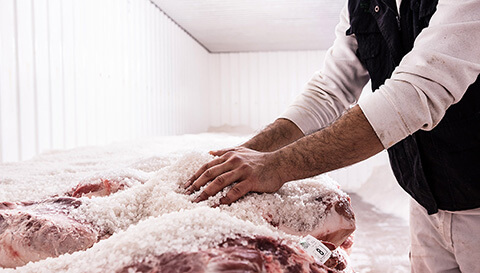 We built our curing houses in some of the best, coldest places in the village which, together with their special design, help us to cure some of the best ham in Spain. Curing Process 100% Natural curing in the village of Trevélez at 1750m (5700ft) in the Sierra Nevada Natural Park. Cured anywhere in Spain, artificial cooling and heating is allowed throughout the entire process. Curing Time Minimum 17 months. Minimum 7 months. (less humidity, better curing) Maximum 53%. Maximum 57%. (seasalt) Maximum 4,98%. No maximum. Residual quantities at the time of sale to end-consumer. Colour Light-red, gradually changing intensity from exterior to interior. Intensive red throughout. Flavour Very pleasant and smooth flavour and aroma, not salty. Strong, predominantly salty flavour.